We know from an NSA white paper published back in 1996 that the idea of a cryptocurrency far precedes the invention of Bitcoin by the mysterious 'Satoshi Nakamoto' some 12 years later. And debates over whether this character is actually a pseudonym for a CIA or NSA front still rages on today because of it. 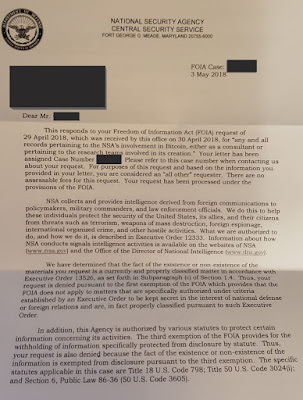 And sadly it appears that the argument may continue on even more as an interesting thing occurred earlier this month as a FOIA request by Global Intel Hub to the NSA resulted in a denial by the agency under the auspices that the information on who or what Satoshi Nakamoto is was deemed classified. With the price of Bitcoin having already soared at one point to over $20,000 per coin, and trending right now between $8000 and $9000, many have wondered why the originator of the cryptocurrency has never once sold any of their holdings, especially since it is worth $10's of billion of dollars. And this of course begs the question as to whether the cryptocurrency is simply a huge experiment by the government to see how people would respond to a digital currency system. It is no coincidence that Satoshi's own White Paper was published during the same month as the stock market crash of 2008 (Oct. 2008), and began the evolution of cryptocurrencies, crypto exchanges, and a race to replace the old system with a digitized Blockchain ledger. And perhaps until all decentralized cryptocurrencies suddenly become outlawed by sovereign governments, no one will ever know the real answer as to whether Satoshi is an activist against the establishment, or the establishment itself using the public's wariness of central banks against them for a more maniacal purpose.